Seems like a simple question, but for many of us it's really not. I remember a friend of mine, Michael Shirley, telling me one time that I should always have a thirty-second elevator conversation memorized. I sure wish I'd done that, because I got caught off-guard again today. It always seems like that question comes when you least expect it, and from the last person you'd expect to ask you. I guess the reason I struggle with that question, is because it's a lot of things, and it's a little different for everyone. I'm not sure I'll ever be able to get that thirty-second elevator conversation mastered, because there is no right or wrong answer. It's different for everyone. For some Masons, it's a family tradition. It's something the men in their family have been involved in generation after generation. I watched a remarkable scene at the Valley of Indianapolis a few years ago, as four generations from the same family stood on a staircase and had their picture taken together--that's the son that was becoming a 32nd Degree that weekend, the father, the grand-father, and the great-grandfather. For others, it's the promise the fraternity makes to "make good men better." There is without question a very strong self-improvement aspect to the fraternity. It's one of the few places where character is not only important, but it's taught. 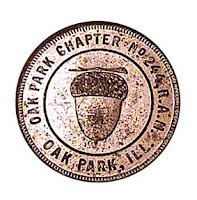 It's part of our tradition, and being a man of character is a requirement for membership. 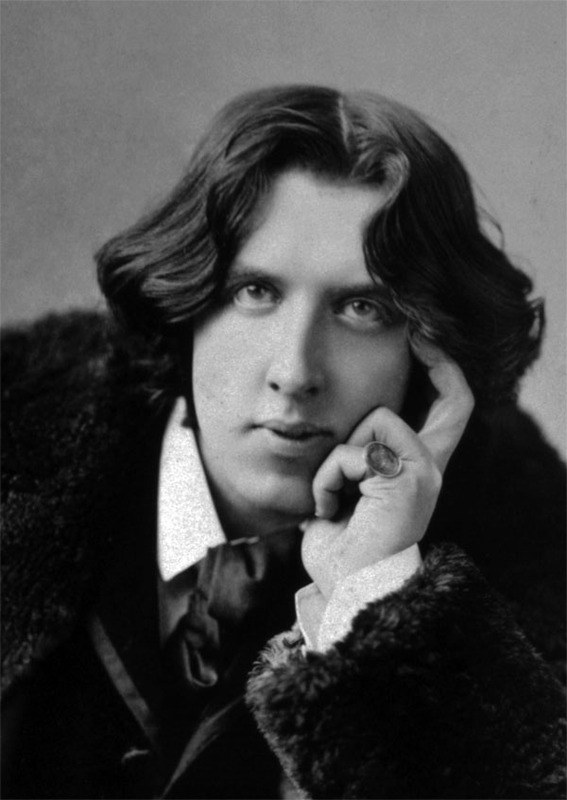 Some seek that out when they join, and for others of us, we find that becoming a better man is the natural result of spending time with men of impeccible character. As I've learned, character can rub off upon repeated exposure. For some men, Freemasonry provides an opportunity to give--and the ability to do that in our fraternity is endless. Our local lodges, our blue lodges, help build the communities they're in. They support all kinds of worthy causes from Little League and scouts (boys and girls), to community improvement projects. Many help with individual needs of members in the community. I talked to a Tyler in a lodge a couple years ago, and he said he had the keys to a dozen post office boxes in his town, and every day, he picked up the mail for the senior citizens in town that had trouble getting out, most of whom weren't Masons, and delivered their mail to them. Then there is the Scottish Rite with their Learning Centers for Dyslexic Children, and the Shriners Hospitals, and the Knights Templar's Eye Foundation, and the list goes on and on. And there's also the social aspect. There's the opportunity to make new friends where you'd never expect to find them. 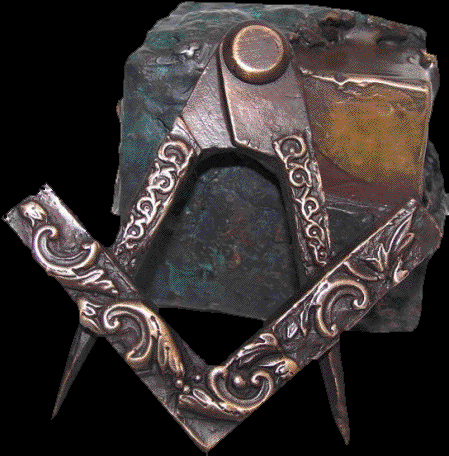 We all share this same thing in common--we're all Master Masons. It's a place where age, experience, race, religion, educational background, and social status doesn't matter. I visited the Valley of Bloomington, Illinois several years ago, and a big group of Masons was sitting at a round table enjoying coffee and donuts. Nobody thought twice about sitting down at a table of men they didn't know because they all were Masons--we're all friends. There were about ten of us. We were visiting and laughing for a long time, and I got curious about who all these guys were that had so been enjoying each others company. At that big table, we had a judge, a farmer, a bartender, a mechanic, an accountant, an electrician, an attorney, a politician, and a high school biology teacher. And you know what? Even after we found out--it didn't matter. And these are just a few of the benefits being a Mason can provide. I watched tonight as a newly initiated Mason stood on the northeast corner for the first time. Afterwards the Master Mason that most recently stood on that same corner offered up some advice for the newly initiated. "You get out of it, what you put into it." I got the same advice a few years ago, probably from the same Master Mason he got it from. But in my experience, I've learned, that advice is wrong. You can never put into it what you get out of it. It's impossible. Where else on earth can you spend a couple hours on a Tuesday night, and get a week's worth of inspiration? 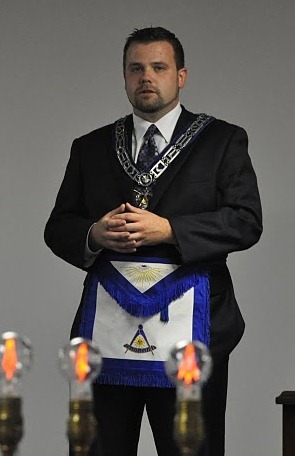 I'm going to work on the thirty-second elevator conversation that answers the question "What is Freemasonry." When I get it, I'm going to post it here, but I wouldn't hold your breath because Freemasonry is simply what you make it. 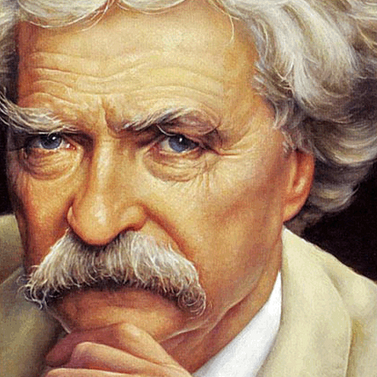 "It is better to deserve honors and not have them than have them and not deserve them." You know what ol' Henry was saying? You're only limited by what you really and truly believe you can do. Success in any endeavor is based on belief alone. Confidence that your plan is good, and it's going to work is the key to being successful in it. It's only a lack of confidence, and lingering doubt that takes the air out of a good plan and leads to failure. If anybody has learned that lesson well, it's me. Come up with an idea, come up with a plan, and charge forward with it without a single lingering doubt, and keep going through every obstacle, and you'll surprise yourself at what can happen. One thing I noted in nearly all of the Famous American Freemasons I've profiled in my books over the years, was this belief that nothing is impossible. 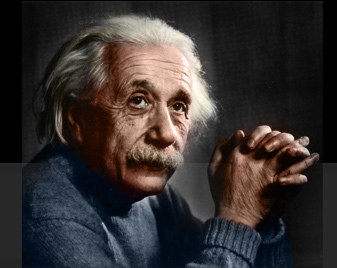 In fact, I think most of them achieved success and fame because of that belief alone. They had their own ideas about how things should work. They had their own opinions, and refused to believe anyone that said what they were planning on doing couldn't be done. Just think of the stories that wouldn't exist in our history if it weren't for people that believed the impossible was possible. Lewis & Clark. Charles Lindbergh. 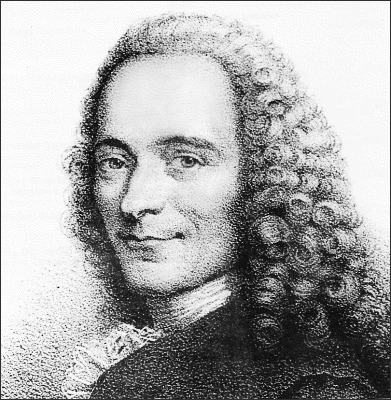 John Paul Jones. The Doolittle Raid. And even, the American Revolution--the first great grassroots uprisings that actually succeeded! Without question, the most successful men in our history were those that wrote their own rules, set their own standards, and ignored those naysayers that predicted failure, and charged on, driven by the beat of their own drum alone. We wouldn't be where we are today without them. If you don't know these stories, you should. They are inspirational. And while it's history, those principles still work today. There's a good source where you can learn a few of these stories. They are in my books. This is my favorite kind of story. As Freemasons, I think we've all had that experience of meeting a stranger and discovering a Brother instead. It's a great thing about our fraternity how a ring, a pin, a shirt, or a bumpersticker can bring two people together who may be different in every other way--but they have that one common experience that instantly makes them friends. I'd like to thank WB Ray Gordon of Pekin for sharing this story with me, and allowing me to share it here too. "We took a drive on the Southern IL leg of Route 66 Bloomington to St. Louis on Saturday. We stopped at The Ariston Cafe in Litchfield. 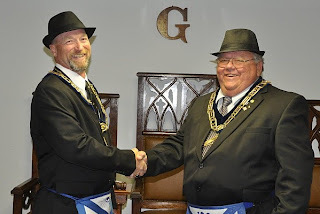 I was wearing a Masonic shirt that day, and as we walked in we were greeted by the owner Brother Nick Adam’s who said, “I see you’ve traveled some” then as I sit down he handed me a piece of paper folded in half. I opened it up and it read. Wherever you may chance to be, wherever you may roam. 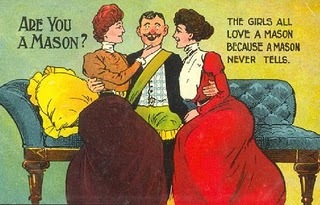 It always gives you pleasure, it makes your heart strings hum. When you get the brother’s greeting, and he takes you by the hand. It thrills you with a feeling, which you cannot understand. It always gives me pleasure when I am greeted by a brother in this manner. In many ways, we've become a very selfish and self-indulgent society. Good manners often seem to be a thing of the past. We don't even do the small things anymore, like saying "thank you" when somebody holds a door open for you. How about thanking a waitress by tipping more than the standard 15% when you receive good service? Or pointing out to others when somebody has done something worthwhile. When you begin to look at what you can do for other people, instead of what they can do for you, the rewards are immeasureable. Masonic Collectibles: One Man's Trash . . .
One thing I've discovered since I joined the Fraternity, is that there are a lot of collectors of Masonic memorabilia--and I'm one of them. It's unbelievable how much of this stuff is out there. You could fill an entire library with just books on the topic of Freemasonry (and many collectors do). And of course you'll need a few Masonic bookends for that library (and I don't know how many different kinds of Masonic bookends I've run across). 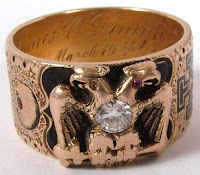 Another highly collectible favorite is antique Masonic jewlery--the quality and styling of some of the old Masonic rings is absolutely stunning. And there are watches, tie tacks, lapel pins, cuff links, shirt studs. And you'll find it everywhere. Garage sales, flea markets, antique stores, thrift shops, estate sales. You could never collect it all in a lifetime--especially the lapel pins. Some of the jewelry will run you, but the nice thing about collecting Masonic memorabilia is that you don't have to spend a fortune to build a nice collection. I only have a modest collection, but I started by collecting Royal Arch Chapter Pennies. My wife dragged me to the Covered Bridge Festival in Indiana (as she does every year). It's acres and acres of flea markets. I got bored and started looking in cases. I found an old Royal Arch penny in one of the cases. I bought it, and then I was on a mission from that point forward. I found four more that day before we left, and never paid more than $3 for one. And that's how it began. Some collectors get pretty specific. Some only collect items from one Masonic body--like the Scottish Rite or Shrine. Other's just collect one thing--I know a collector in Ohio that only collects Knights Templar swords. He won't tell me how many he has, which is a good sign he has a lot. Another guy I know collects Masonic tableware (that's right, plates, glassware, cutlery, etc.) Back in the day, and still in many places today, the Freemasons put on very fancy dinners and table lodges. 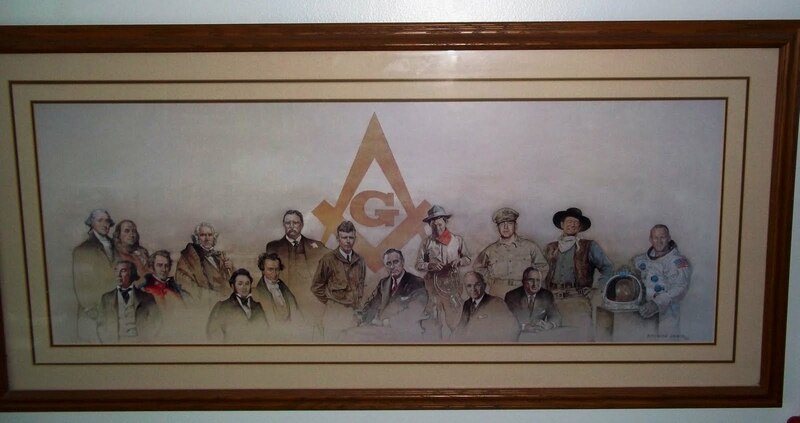 And there are a lot of Masons that collect Masonic prints, photographs, and postcards. Another fun part of collecting is finding things for other collectors you know. It's always fun to run across something that doesn't interest you very much, but you know one of your friends would flip over. I ran across an old Shriners fez not too long ago, and sent a picture with no text attached to a guy I know that collects Shriners memorabilia. I got a two word response--how much? Boy was he happy when I told him what it was selling for! I collect a little bit of everything. One of my favorite pieces is one I got for my birthday a couple years ago from my parents. 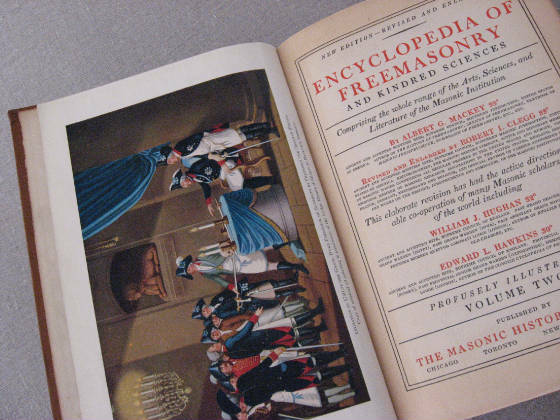 Could you think of better gift for a Mason known for writing books about Famous American Freemasons, than an old print featuring a group of famous American Freemasons? So next time your wife drags you antiquing, or to the fleas market, why don't you see if you can find any old Masonic stuff amongst the treasurers on display. You might just find a passion for collecting like many other Masons have, and instead of your wife dragging you to those things, you'll be dragging her! 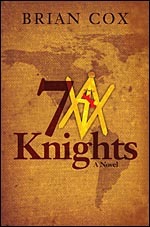 My friend (and Brother Master Mason) Brian Cox published his long-awaited book earlier this week 7 Knights and it's available at Amazon.com and Barnes & Noble (amongst others). I got my autographed copy last week when I went to see him speak at a local lodge. I just got started into reading it last night, but I can tell you it's difficult to put down once you get started. I'll no doubt have more to say about it once I get done. In the meantime--congratulations to Brian on the publication of his first novel! Recent West Point graduate Walt Tyler has nearly everything in life: respect as a successful quarterback, the affection of an attractive doctor, and a well laid-out military career. But Walt is plunged into the fight of his life when terrorists begin killing off the hidden network of Templar Knights, led by seven vital figures. Walt's grandfather, newly elected U.S. President Preston Tyler, one of the seven, holds the key to protecting the knights. He reveals to Walt the clandestine establishment intended to protect Christians during the last days. Having existed since the inception of the Knights Templar, the cryptic order of the Seven Knights has remained veiled for centuries. Brought up through history under the blanket of the Ancient Free and Accepted Masons, the Seven Knights maintain an exclusive membership of only seven men, powerful individuals including politicians, military leaders, corporate geniuses, and financiers from around the globe. The sudden attack on the knights can only mean one thing: the antichrist is coming. In Brian Cox's gripping novel, Walt and Preston's desperate escape leads them along a modern underground railroad through the long-established safe havens of the Biltmore and the Hermitage as they attempt to discover by whom their death is being sought and how their centuries-old secret has leaked. Can Walt and Preston stop the terrorists before all Seven Knights are murdered? 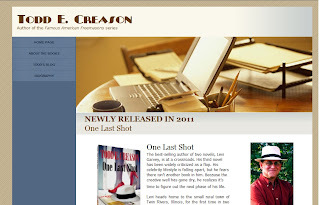 My author website at toddcreason.org just got a huge facelift. Every year or two, we got through the tedious task of revamping and reinventing my website so it doesn't get stale. It seems like we just did that, but actually it was nearly two years ago. You'll never believe this, but it's true--I did it all by myself this time. It looks a lot cleaner, and not as dark and foreboding as the last one was. I like it, but it still needs a few tweaks here and there, and I don't have all the content on there . It is way less complicated now, and I can update it myself. The only reason I started the blog was that putting anything on my website was such a nightmare it wasn't worth it. The last phase I'll finish up this weekend. I need to finish tweaking the blog--and I really need a different name. I've got nothin'. I think I finally got it! I've had a breakthrough! It looks like this project is a go. . . finally. It always starts the same way. I start with about a hundred and fifty names of worthy Famous American Freemasons written on business cards, and a bulletin board. I've sometimes spent weeks narrowing that list down to just thirty names. I'll change up the categories, I'll take a few names out of the mix, sometimes I have to go back and find some more names. When I finally get those names and categories finalized, I tack those names down, and hang the bulletin board on the wall in my cave--but the names and the categories often continue to change even as I'm researching and writing the book. It's not as easy as you might think, because there are a few things I like to do in each section of the book. I like to include a couple names in each category everybody knows well, a couple most people are familiar with but don't know that much about, and maybe one name few people would know--but should. 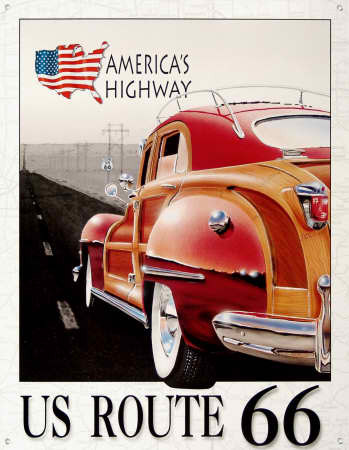 And I also like to cover several different eras in American history in each category too. So basically, I make it as difficult on myself as possible. I've had a terrible time getting this volume to work out to my satisfaction, and had pretty much given up on the idea there was ever going to be a Volume III. In fact, I've made it widely known there wouldn't be another one. That's part of the reason I took some time off the midnight shift. I decided to take a little time to sit back and try and decide what I was going to do next. Another novel? Take up another Freemasonry topic to write about? Or finally finish the the Famous American Freemason series I started back in 2006? The decision is made. I'm going to finish the Famous American Freemason series next. But that won't be the next book out. I've got one done now. I finished a novel over Memorial Day, A Shot After Midnight. 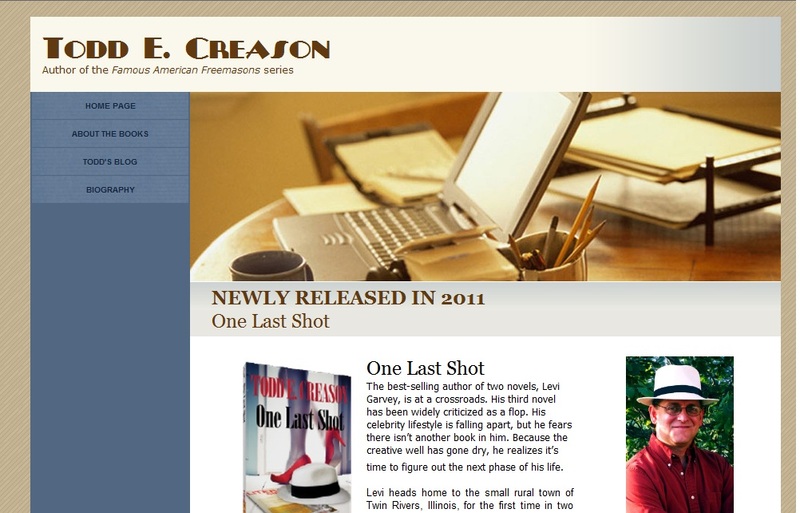 It's a sequel to One Last Shot. We're just beginning the editing process on it. It will be out in Spring of 2012. 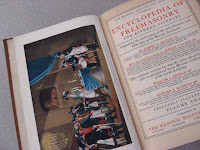 So I'm shooting for a Fall 2012 release for the final volume of Famous American Freemasons. For some reason, I seem to finish fiction in the spring and non-fiction in the fall. So within the next month or so, my sunny blog will go dark again, the moon and stars motif will return, and the midnight shifts will resume. I should be well rested, energized, and ready to tackle it by then. If you have a favorite Famous American Freemason I haven't written about yet, please feel free to email me at webmaster@toddcreason.org. As I said, that line-up will go through some changes--it's just a starting point. In fact, a suggestion a friend of mine made was the key to getting this line-up to finally work--it lead me to a whole new category I hadn't explored in the series yet.